Eastern has been importing the Messersi line of tracked dumpers since 2001.Messersi also builds the Wacker Neuson and Allen dumpers under a private label agreement. - Tracked dumper with hydrostatic transmission having two independent circuits with variable displacement axial piston pump and two speeds axial piston motor for each track. - Machine with two speeds with electric selection. - Controls are completely pilot assisted through joy-sticks assembled on the armrests of the driver's seat, which is rotating of 180° to keep the operator always oriented in the running direction. A particular electric-hydraulic switch permits to maintain the position of the joy-stick's control in correspondence with the running direction however the seat is oriented. - Counter-rotation of the tracks. - Mechanical parking brake with negative control to stop the machine on deep slopes. - Chassis with modular structure composed of a tractor unit set up on a unified frame apt to receive various attachments. undercarriage with oscillating axles and rubber tracks, suitable for high speeds. The considerable ground clearance allows the easy motion even on dirt patches and on rough terrains. - Tracked machine on bearing rollers supported by “long life” rolling taper roller bearings. - Loading body with automatic unloading on the three sides , moved by joy-stick. The high front dumping angle permits a perfect unloading even on slopes. - The engine considerable oversized for the features of the machine, is placed under a big bonnet, tiltable, allowing an easy and comfortable access to all the components of the transmission, of the engine and of the hydraulic system for a quick and safe maintenance of the machine. 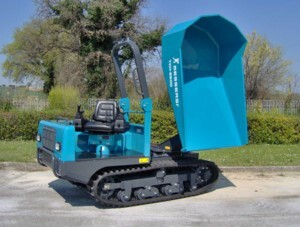 - As optional fitting the machine can be equipped with a hydraulic P.T.O. With delivery of 43 l/min at 170 bar, deliverable even after the purchase of the machine.For product literature click here You will need adobe acrobat to open the file.